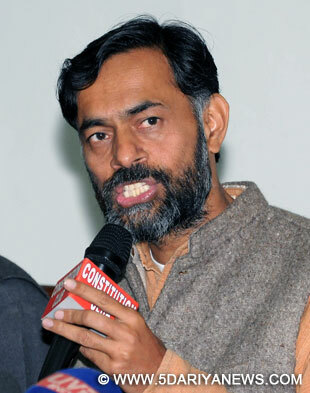 AAP's Yogendra Yadav who filed his nomination papers Thursday for the Gurgaon Lok Sabha seat, said in his affidavit that he owns nearly two acres of land in Haryana and had only Rs.2,000 cash in hand.Yadav was among seven candidates who filed their papers Thursday, officials said.The Congress' Rao Dharampal, Indian National Lok Dal's Zakir Hussain, Bahujan Samaj Party's Dharampal Pahalwan Rathi and Independent candidate Abdul Latif also filed their papers.Aam Aadmi Party candidate Yadav along with party workers took out a procession led by a number of women carrying the party's broom symbol in their hands.Yadav said in his affidavit he has taken Rs.13,87,505 as loan from financial institutions. His total income in 2012-13 was Rs.18,01,750 while his wife Madhulika's income in 2009-10 was Rs.2,60,724.His total movable and immovable assets were worth Rs.81,43,023 and he has Rs.9,75,955 in his four bank accounts in Delhi and Gurgaon.Yadav said he purchased nearly two acres of land in his native village Saharanwas in Rewari district in 2003. The current cost of the land was estimated to be around Rs.90 lakh.Yadav also owns a car and describes himself as senior fellow at the Centre for the Study of Developing Societies. His spouse Madhulika is associate professor at Delhi University.